Even if you live in an older home, there's no reason not to satisfy your high-tech inner geek with these five smart wireless innovations. There was a time when someone who loves old homes would have found it tough to satisfy his inner high-tech geek. But with the proliferation of all things wireless, achieving a bit of the Jetsons’ style in a vintage bungalow, Victorian, or Cape has become nearly as easy as clicking a mouse. Here are five technological innovations that can rocket your old home straight into the 21st century. Speaking of the Jetsons, remember the video intercom? 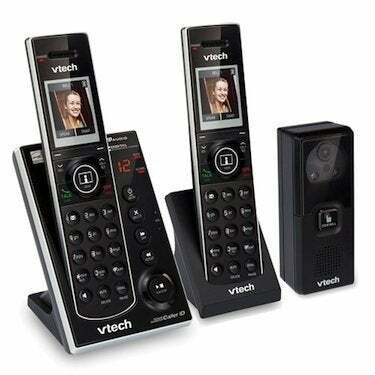 Phone manufacturer VTech Communications has brought that tech of tomorrow into the here and now via your home phone system. Their video doorbell is simple to install—you just put the doorbell module outside your front door and plug in the phones. It’s shockingly simple to use, too. When someone rings the bell, the system snaps a photo and sends it to all of the phone handsets. At that point, you can decide to go answer the door or—even more fun—simply start the streaming video from the doorbell unit and talk to your visitor through the handset. In addition to providing instant info on who’s standing outside, the system also captures up to 100 photos that can show you everyone who stopped by when you weren’t home. It even has night vision! And lest you forget, this is a phone, too, so you get other neat features like Caller ID that announces the name of the person calling, 14 minutes of digital answering machine recording time, and an audio equalizer that lets you choose the sound profile that’s easiest on your ears. Plus it doubles as an in-house walkie-talkie. Life is busy today. So busy, in fact, that a lot of us don’t spend nearly as much time at home as we’d like. But just because we’re on the road, in the skies, or slaving away at the office doesn’t mean we can’t stop in at home—at least virtually—through the latest home automation systems. The Insteon suite of monitoring equipment consists of a main hub and modules that plug in around your home. The system uses two types of frequencies—radio and electrical—to connect all the modules to the hub and each other. Once the plug-and-use system is installed, you can control things like the lights, electric garage door openers, and thermostats from your smartphone or tablet. You can also install motion sensors and cameras that will alert you to movement in the home. You can even program lights to turn on and off at specific and varying times. Lowe’s solution for home automation is called Iris and works much like the Insteon system. Although there is no monthly charge for either Insteon or Iris, the Lowe’s version does have an $9.99 upgrade that allows you to create what they call “magic” rules, which allow you to keep an eye on kids or elderly relatives who are supposed to be following a set routine. Of course, the easiest and most powerful way to bring an older home into the modern era is to install Wi-Fi. Assuming you’re not truly living in the past and have already done that, one of the coolest ways to take advantage of the Internet-everywhere signal is through smart TVs. Samsung makes a line of TVs with built in Wi-Fi that let you surf the Internet; watch services like Hulu, Netflix, and more; and take advantage of apps, like the one that lets you play Texas Hold ‘Em right from your sofa. If you’re not quite ready to upgrade your TV, you could consider going with an external Web TV box like Apple TV, Roku, or a Web-enabled Blu-Ray player. They all let you stream extensive content from the Web, potentially saving you hundreds of dollars a year should you decide to ditch your cable company. 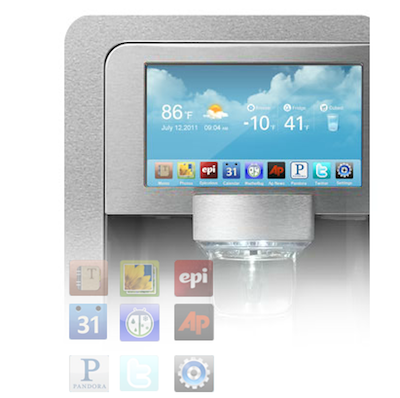 The refrigerator has long been a place to store your applesauce, but your apps? The ponderously named RF4289HARS refrigerator from Samsung has an 8-inch LCD display built into the door that functions like a mini Wi-Fi–enabled tablet. It comes bundled with apps that let you leave notes for other family members, find the perfect recipe for dinner, and check the weather. It also lets you pull in your Twitter feed, stream music from Pandora Internet radio, and get the latest news from the AP. Oh yeah, and about that refrigeration part: You can control the fridge’s temp settings and ice-making function right from the touch screen too! It’s a refrigerator sure to satisfy even the most modern family’s appetite for tech, no matter how old their home is. For a relatively old technology, steam is all the rage in today’s cutting-edge washers and dryers. Steam molecules, the thinking goes, are smaller than water molecules, so they do a better job penetrating fabrics to carry away dirt and allergens. LG manufactures a line of dryers that can be set on a “TrueSteam” or “SteamSanitary” cycle to release wrinkles from clothes or get “unwashable” items like stuffed animals completely clean. They also manufacture a washer featuring a steam-specific “Allergiene Cycle,” which supposedly removes more than 95 percent of common household allergens. Even Jane Jetson would have been impressed. The use of steam isn’t the only thing that makes the washers and dryers smart. Many of them also feature what LG calls Smart Thinq technology, which can run the washer when electric rates are the lowest, and can interact with your smartphone to help diagnose operating issues and download new and improved wash cycles from the Internet.